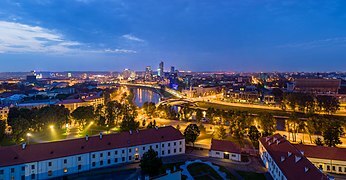 Vilnius (Lithuanian pronunciation: [ˈvʲɪlʲnʲʊs] ( listen), see also other names) is the capital of Lithuania and its largest city, with a population of 574,147 as of 2018[update]. 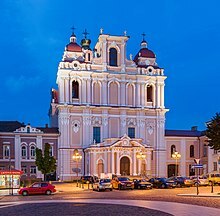 Vilnius is in the southeast part of Lithuania and is the second largest city in the Baltic states. 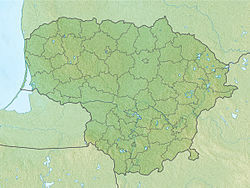 Vilnius is the seat of the main government institutions of Lithuania and the Vilnius District Municipality. 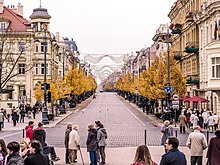 Vilnius is classified as a Gamma global city according to GaWC studies, and is known for the architecture in its Old Town, declared a UNESCO World Heritage Site in 1994. Before World War II, Vilnius was one of the largest Jewish centres in Europe. 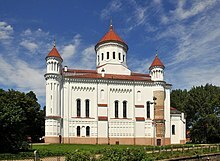 Its Jewish influence has led to it being described as the "Jerusalem of Lithuania" and Napoleon named it "the Jerusalem of the North" as he was passing through in 1812. 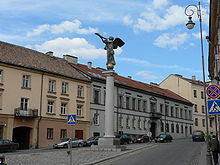 In 2009, Vilnius was the European Capital of Culture, together with the Austrian city of Linz. ^ "Statistinės suvestinės: Gyventojų skaičius pagal savivaldybes 2018 m. sausio 1 d." [Statistical summaries: number of inhabitants in municipalities as of 1 January 2018]. Vilnius (in Lithuanian). Valstybės įmonė Registrų centras [State Enterprise Center of Registers of Lithuania]. 2018-01-01. Retrieved 2018-09-02. ^ Jonathan Steele (19 June 2008). "In the Jerusalem of the North, the Jewish story is forgotten". Opinion. The Guardian. Archived from the original on 14 January 2018. Retrieved 2018-03-04. ^ Ewelina Tylińska. "The revival of the Vilnius University in 1919: Historical conditions and importance for Polish science". In M. Kokowski. The Global and the Local: The History of Science and the Cultural Integration of Europe. 2nd ICESHS (Cracow, Poland, September 6–9, 2006). p. 896. ^ Josef Krauski (1992). 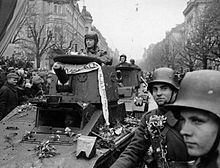 "Education as Resistance: The Polish Experience of Schooling During the War". In Roy Lowe. Education and the Second World War : studies in schooling and social change. Falmer Press. p. 130. ISBN 0-7507-0054-8. ^ "Lietuvos gyventojai 2011 metais (2011 m. gyventojų surašymo rezultatai / Lithuanian 2011 Population Census in Brief)" [Population of Lithuania in 2011 (Population Census 2011 results)]. Statistics Department of Lithuania. ISBN 978-9955-797-17-3. Retrieved 2018-03-11. ^ Słownik geograficzny Królestwa Polskiego i innych krajów słowiańskich, Tom XIII [Geographical dictionary of the Kingdom of Poland and other Slavic countries, Volume XIII] (in Polish). Warsaw. 1893. p. 493. Retrieved 2018-03-10. ^ "About us". www.mmcentras.lt. Retrieved 2017-02-03. ^ "Projects". www.mmcentras.lt. Retrieved 2017-02-03. ^ "History – Largest Concert Institution in Lithuania". Lithuanian National Philharmonic Society. Retrieved 2017-02-03. ^ "Pagrindiniai duomenys apie Vilniaus miesto savivaldybės švietimo įstaigas" [Basic data on Vilnius city municipality educational institutions]. www.vilnius.lt (in Lithuanian). Vilniaus miesto savivaldybė. Retrieved 2017-02-02. ^ a b "Facts and Figures". Vilnius University. 1 October 2016. Archived from the original on 2017-02-05. Retrieved 2017-02-02. ^ "Breaking News for Lithuania: VU – Among the Top 500 Universities in the World". Vilnius University. 7 September 2016. Archived from the original on 2016-11-21. Retrieved 2017-02-02. ^ "Programmes in English". Vilnius University. Retrieved 2018-03-05. ^ "MRU students – The Number of Students at the University". www.mruni.eu. Mykolas Romeris University. Retrieved 2017-02-02. ^ "About University". www.vgtu.lt. Vilnius Gediminas Technical University. Retrieved 2017-02-02. ^ "Facts and Figures – About LEU". leu.lt. Lithuanian University of Educational Sciences. Retrieved 2017-02-02. 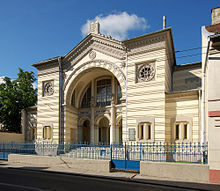 ^ "Vilnius Art Academy Museum". www.muziejai.lt. Lithuanian Art Museum. Retrieved 2017-02-02. 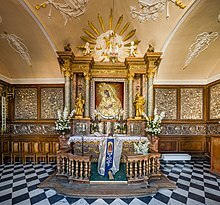 ^ "Gyventojai pagal religinę bendruomenę, kuriai jie save priskyrė, savivaldybėse" [Residents according to the religious community they attributed themselves to, by municipalities] (.xls) (in Lithuanian). Statistics Lithuania. 2013-03-15. Retrieved 2016-05-14. ^ Geggel, Laura (1 August 2015). "Remains of Nazi-Destroyed Synagogue Found Using Radar". Live Science. livescience.com. Retrieved 2018-05-25. ^ Tapani Harviainen (1997). "New Life in Karaim Communities". In M'Hammed Sabour; Knut S. Vikør. Ethnic encounter and cultural change : papers from the Third Nordic Conference on Middle Eastern Studies, Joensuu, 1995. Euronet.nl. Bergen: Nordic Society for Middle Eastern Studies. pp. 72–83. ISBN 1850653119. Archived from the original on 3 April 2009. Retrieved 6 May 2009. ^ "LFF stadionas". Lietuvos futbolo federacija. Retrieved 2018-03-11. 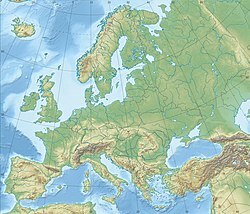 ^ "Vilnius International Airport – Flight map". www.vilnius-airport.lt. Retrieved 2017-02-02. ^ "Miestai partneriai" [Partner cities]. iVilnius.lt (in Lithuanian). In Vilnius. Retrieved 2015-09-26. 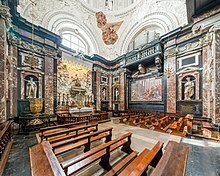 ^ "Vilnius ir Lvovas pasirašė bendradarbiavimo sutartį | kl.lt" (in Lithuanian). Klaipeda.diena.lt. 2014-03-07. Retrieved 2015-09-26.